In a generous corner of the kitchen at Belgian Fries in Vancouver, there’s a two-metre-high stack of hessian bags full of locally grown Kennebec potatoes. In short order they will be peeled, scrubbed and chopped into fries — one of the three elements of what many have said is the best-tasting poutine just about anywhere. Others may claim the title — goodness knows there’s enough of this delicious, heart-stopping stuff around — but meanwhile Ali Faghani will keep filling his mustard-coloured restaurant on Commercial Drive with fans, striving daily to make 16 perfect versions of this Quebec-invented treat that in recent years has become a runaway icon of Canadian gastronomy. 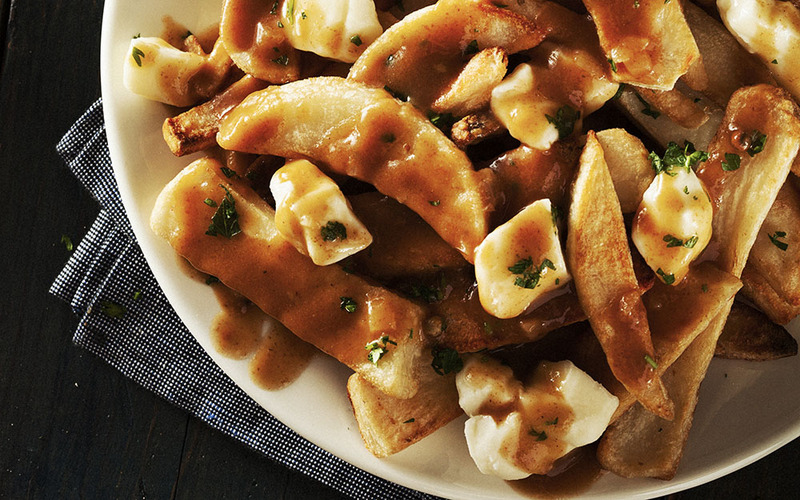 It’s pretty obvious why we all love poutine. Make a pudding of perfect fries — crunchy on the outside, soft on the inside — top them with cheese curds and load all of that up with great-tasting gravy; it leaves mac and cheese in the dust. And it’s so easy to make, which is why everyone is doing it. From food courts to weekend festivals, to ski resorts, pubs, food trucks, movie caterers, fast and slow-food restaurants to folks like us at home who toss it together for a Friday-night nosh or as a cure for a Saturday morning hangover. Poutine came out in the ’50s in Quebec — was it actually Drumondville or Warwick? — and has sloshed its way into the mainstream ever since. A foodie friend of mine in Montreal sent this along when I was researching poutine’s legendary magic: “Poutine is student food,” she said. “You’re poor, you partied all night and by two a.m. you’re hungry. For a couple of dollars you can fill your stomach with the ultimate comfort food. I had a poutine at a restaurant called Le Pied de Cochon in Montreal, where some substitutions were made, but it was still a poutine: A fine sauce replaced the thick gravy; a refined cheese replaced the usual cheese curds and it was topped with foie gras.” Wow. Iranian-Canadian Ali became the owner-operator of Belgian Fries in 2004. He had been in an industry that was going sideways and moved into a spot that had previously been a MoneyMart. He funkeyed it up, doubled its size and committed himself to a life of perfect poutine and other foods that his fabled street locale could and would love. Those Kennebec potatoes were key. He found a farmer in the nearby Fraser Delta who supplies them year round. He made a trip to Amsterdam and elsewhere in Europe, taking notes as to what makes a fry great. He tasted poutines from across Canada and was determined to do it right. Yes, the fries are important. After being cut into shape mid-morning, Ali’s chips get their first taste of hot canola oil. After that, they remain in wire baskets ready for the first onslaught of the lunch crowd. Almost to order they get their second fry, a temperature-controlled dip that cooks them crunchy golden brown. Curds are from an international supplier. His gravy is cornstarch-based and home grown. The seasonings are Ali’s secrets. The classic is his big seller — simply fries, curds and gravy. The Delight adds mushrooms, red pepper, onion and eggplant. The Divine features the restaurant’s from-scratch pulled pork; the Deluxe is a classic, plus mushrooms, red pepper, onion and bacon. There’s no foie gras or caviar on the 16-poutine menu, but there’s chili, butter chicken and shrimp. It’s still poutine. I asked a gym buddy, whose stomach was about the same size as the ball he was draping himself over, if he’d ever had one. I told him it seemed like a total insult to the foie gras. Poutine has more than enough going for it the way it is. But for taste and texture thrill, why not? Montreal, Kamloops, Winnipeg, Halifax or wherever you eat it, this saucy dish is the magnificent mess you get. And aren’t all great dishes there for the doctoring? What actually is chili or strogonoff or quiche? Bottom line, no matter how you put it together — double-fried fries, cheese curds and gravy — it’s always disgusting but delicious and up for a challenge. Why not take it totally over the top with foie gras? Like a well-cobbled stew, poutine really does invite an array of exotica to add to its Quebec-legend base. Chunks of lobster? Not only does it look reasonable, but it tastes extravagantly terrific. A curry? That too. Shred on some cooked shoulder of lamb. Shrimp would also work. The small variety. Your gravy may well be a béchamel. The thing is, that once the crispy fries have been topped with curds and gravy, just about anything goes, even if caviar is too ridiculously extravagant to contemplate. We all have a favourite sausage. Some need cooking, but others don’t. Slice it up, heat it, and place it neatly onto the curds before you add the hot gravy. This could be the most respectable combination of all. The same with your favourite chili and the leftovers from last night’s great stir-fry. Simply remember the basics that made poutine what it was in the first place. Use great potatoes; don’t worry about peeling them. When they have been cut into fry shapes, rinse them thoroughly, and then rinse them again. Twice frying makes for a crisp outside, soft inside fry. The curds will be available in the dairy department or at the deli. Start your gravy with a roux of butter and flour, add stock, simmer and season to taste, with more rather than less pepper. Bring the three elements together — and it’s poutine. Anything else is up to you. The gravy should be substantial, but still thin enough to easily filter down into the mass of fries and cheese curds. These sauces typically also contain vinegar or a sour flavouring to balance the richness of the cheese and fries. Traditional poutine sauces (mélange à sauce poutine) are sold in Quebec, Ontario and Maritime grocery stores in jars or cans and in powdered mix packets. Recently, some outlets have begun to offer vegetarian gravy as an option. Heavy beef or pork-based brown gravies are rarely used. To maintain the texture of the fries, the cheese curds and gravy are added immediately prior to serving the dish. The hot gravy is usually poured over the room-temperature cheese curds, so that the cheese is warmed without completely melting. It is important to control the temperature, timing and the order in which the ingredients are added, so as to obtain the right food textures, which are an essential part of the experience of eating poutine. But our own observation is that poutine is a forgiving dish and no matter how you put it together, it will still be demolished by the hungry hordes. I have yet to present poutine at a formal dinner, but the more I see of it, the more I think it might work. And wines? Take your pick once you’ve worked out your topping. But just as poutine invites something more than simply fries, curds and gravy, so too does it suggest an array of tastes in wine. I’d go for a mid-range bubbly just to get the folks grinning, then settle down to something from eastern Canada — a pairing that gives a friendly nod to poutine’s origins. Chambar is an iconic Belgian-seasoned Vancouver restaurant, located near the entrance to historic Gastown. Chef-owner Nico Schuermans kindly provided this recipe for Chambar’s poutine that brings together the tastes of fries, peppercorn sauce and Roquefort cheese. It’s an ongoing Chambar favourite. Cut potatoes into 1cm squared strips lengthwise and soak for 24 hours. In a large pot, heat water to 175˚F. Blanch potatoes for 3 minutes, then remove and allow to cool on a flat surface. In a large, deep pot, heat canola oil to 375˚F, making sure to use enough oil to fully submerge the potatoes. Fry potato slices until golden brown. Remove from oil and dust with salt and paprika. Note: for a much more flavourful frite try substituting normal canola oil for a ratio of 50% beef fat to 50% canola oil. In a saucepot on high, bring chicken stock to a boil. Add cooking wine, tomato paste and balsamic vinegar. Reduce liquid to just less than 50% of original volume. Next, season with sherry vinegar and salt. Once you have a balanced flavour remove from heat and add the whole black peppercorns and fresh herbs. Allow to simmer. Strain before using. Note: For a richer, fuller-bodied sauce add more tomato paste and balsamic vinegar. For a thicker sauce whisk in a small amount of cornstarch mixed with water and bring the sauce back to a boil for 30 seconds. Preheat oven to highest temperature or set to broil. In a mixing bowl, place the cheese, peppercorns, crisp garlic, and freshly fried and seasoned potatoes. Mix well and place into an oven-friendly bowl. Cook for about 3 minutes, keeping a close eye on the poutine, ensuring it does not burn. Remove from oven. Place frites mixture in a serving bowl and top with heated gravy or peppercorn sauce, green onion, parsley and Vincotto. Serve immediately. As a bienvenue treat for a rare visit I made to Montreal, a friend bought a thousand-gram lobster for dinner. As we sipped on our Dubonnet, the beast squirmed in anticipation in a bag on the kitchen counter. We had planned to make a bisque, gleaned from an epicurious recipe she had in her book, but there wasn’t time. And we knew that the only equipment we had to expose the meat in the claws and tail was a large hammer! It was a mess. Why am I showing you this recipe? A bisque can make a perfect sauce for a seafood inspired poutine. Use with a Swiss or light, gooey cheese. Bring a large pot of water to boil. Plunge lobsters head first into the water and boil until cooked through, about 8 minutes. Using tongs, transfer lobsters to a large bowl. Reserve 2 cups cooking liquid. Cool lobsters. Working over large bowl to catch juices, remove tails and claws. Crack tail and claw shells and remove meat. Coarsely chop meat, cover and chill. Coarsely chop lobster shells and bodies, transfer to a medium bowl. Reserve juices from lobster in large bowl. Heat olive oil in heavy large pot over high heat. Add lobster shells and bodies and sauté until shells begin to brown, about 8 minutes. Add onion and next 8 ingredients. Mix in brandy and sherry. Boil until almost all liquid has evaporated, about 4 minutes. Add fish stock, reserved 2 cups lobster cooking liquid and lobster juices. Simmer 1 hour. Add cream to soup and simmer 5 minutes. Dissolve cornstarch in 1 tbsp water. Add to soup and boil until slightly thickened, about 2 minutes. Mix lobster meat into soup and stir to heat through. It’s ready for the potatoes and cheese.